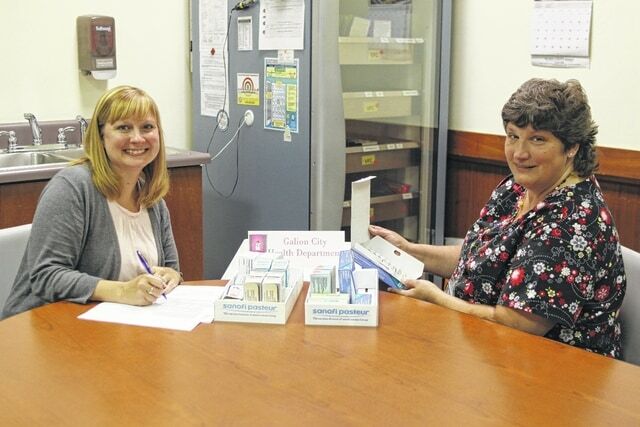 Galion Health Department Director of Nursing Ashley Smith, left, and Public Health Nurse Kara Kimerline pause while performing a monthly inventory of vaccinations. The Galion Health Department is changing the way it handles weekly immunizations. Starting in August, the agency will ask participants to schedule appointments, instead of typical walk-in hours. “The state cut the budget, we are still going through all the paperwork to see how it effects us,” Galion Health Department Commissioner Trish Factor. Ashley Smith, who serves as the Director of Nursing for the Galion Health Department, said that walk-ins will still be held July 13 and 20 and that the program remains important to the agency. “It is so important for public health to do immunizations,” Smith said. Officials also mentioned that the July 27 immunization clinic was cancelled to offer tetnus shots for whooping cough (Tdap) for seventh graders from 1-4 p.m. Aug. 12. Nurse Theresa Swinehart said these shots are important. “Kids are spreading it and don’t even know it,” she said. Immunizations are keeping the Galion Health Department busy. Current Job & Family Services medical cards and many other insurance cards will be accepted and must be provided at time of service. Those with multiple insurance carriers must bring all cards. No VFC eligible child will be denied immunizations due to the inability to pay. “The appointments will give us more time with the customers and give them a little education on what they just got injected with. We also educate them on other things while they are here,” Factor said.